If you want to play a first-person shooter this holiday, take your pick. There's a handful of them, so take your time making your selection. Go on. We'll wait. But first-person platform action games? Well, there's really only Mirror's Edge, an interesting creative risk taken by Battlefield developer Digital Illusions CE. The game puts you in the well-worn cherry-red sneakers of Faith, a "runner" who must deliver information via rooftops to avoid the spying eye of a totalitarian government. 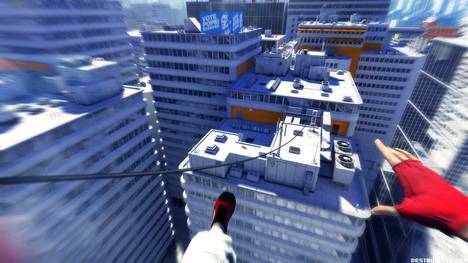 With quick platforming gameplay normally reserved for third-person titles, Mirror's Edge is a first-person title unlike any that's come before it. Does Faith soar, or does she stumble awkwardly off the edge of a high-rise? More after the jump. Let me get this out of the way early: playing Mirror’s Edge can feel as cool as the game has looked in all of the trailers you’ve already seen. The first-person running, the diving, the sliding, the shooting -- it’s all in your control, and for the most part, it works brilliantly. Until now, first-person titles have been best suited for the basics -- shooting things, crouching down to avoid getting shot by things, and a jump button included only to hop over objects that might get in the way of shooting things. 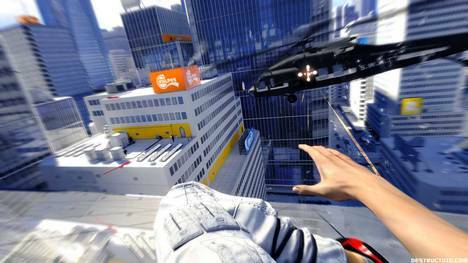 With Mirror’s Edge, DICE flips the script, placing a heavy emphasis on platforming and discouraging head-on combat situations. Control in Mirror’s Edge is simple, with a few buttons used for basic actions like jumping or sliding. When it works, it works great -- the feeling of exhilaration you’ll get from successfully and quickly navigating through a level, or even a single area, is obscenely gratifying. You’ll kick open a door and run across a thin catwalk, leaping to an area below as you break your fall with a well-timed roll or slide. Without slowing down, you’ll hop up and over a fence, sliding under a vent as you land, right before running horizontally across a wall. All of this while avoiding a rain of semi-automatic machine gun fire. It’s like Jackie Chan’s craziest stunts at your fingertips, the kinetic pace of an action flick that will make you feel like a complete and total badass if you know what you’re doing. That is, until the action comes to a halt with an ill-timed button press, and you slam face-first into a wall, bringing Faith to a complete stop. Or you leap towards a pipe, missing it with your hands by an inch, and falling to your death. Or when you unsuccessfully attempt to disarm a cop, and are forced to flail for your life as you’re shot down at point-blank range. While it would be great if the frantic, heart-pounding pace of Mirror’s Edge’s trailers could be kept up throughout the gameplay experience, that’s simply not the case. For every one instance that you’ll string together an awe-inspiring combination of fancy footwork and acrobatics, there will be ten instances of you missing a jump and falling to your death, only to be sent back a few paces to one of the game’s sometimes-punishing checkpoints. Then, after a fairly brief loading screen, you’ll make another attempt to advance, only to plunge to your demise yet again. Once you repeat this cycle a few times, it’ll hit you -- you probably weren’t even headed in the right direction. 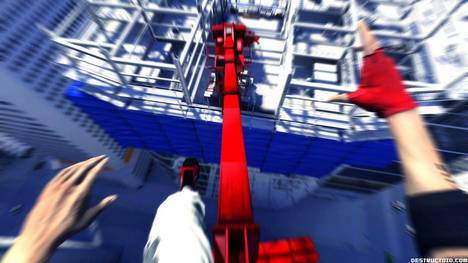 Admittedly, Mirror’s Edge does give you more than a few clues as to where you should be headed next by way of “Runner Vision,” which manifests itself in-game as red objects that guide you through the environment. And by pressing and holding B, Faith will automatically direct her attention towards the direction in which you should be headed. Unfortunately, in indoor areas, the B button will often fail you, sometimes simply directing you at a solid wall or the ceiling. And when you have a barrage of gunfire whizzing by you from all directions, the necessity to keep moving forward will override your ability to spy red objects hidden in the environment. As trying as it can be, it’s easy to overlook the trial-and-error nature of some of the game’s areas; once you do figure out what you’re doing, you’re rewarded with that feeling of being unstoppable. The thrill of speed and fluidity as you hop over, slip under, and roll across rooftops -- the game's stark environments whizzing by -- is an experience unlike any other in gaming. Unfortunately, it’s not possible to overlook some of the game’s inconsistent world rules, which lend themselves to the frustrating areas you’ll likely find yourself repeating ad nauseum. On more than one occasion I found myself trying to make jumps that I would miss -- of distances I was able to reach earlier in the game -- simply because that’s not the path you’re meant to take. And in one particular chase, I was unable to make Faith hop up on the front of a car, which resulted in a failed “mission”; instead I was forced to run around to its side to climb to a higher area. In another instance, I couldn’t hop over a short desk, but was able to use a seat directly next to it to vault myself over it. While the game also features hand-to-hand combat and gunplay, the game design discourages these types of encounters, mostly by making it frustrating and sometimes ineffective. In most instances, head-on encounters with enemies can be avoided, but when you’re forced into it, it fails on a number of levels. When face-to-face with an enemy, you’re given a small window of opportunity to disarm him by quickly pressing a button when his weapon flashes red. If done right, Faith will execute a stylish takedown, and will then be able to use the weapon to take down other enemies in the immediate vicinity. A few problems can arise, however. For one, if you miss the takedown, you’ve automatically put yourself into a s**t situation that will almost always end in your death. Sure, you have a number of attacks at your disposal -- punches, a sliding kick, or a jumping kick -- but each require you to land repeated, ineffectual blows that fail to be of any use. If you do happen to snag a weapon, targeting with the analog stick is surprisingly difficult, considering DICE’s first-person shooter pedigree. And despite the fact that enemies appear to have unlimited ammunition, there’s no way to make Faith reload a weapon; once it’s tapped out, your only option is to toss it aside. For all of the frustration I experienced, there’s something that surprised me about Mirror’s Edge -- I wanted to keep playing it. If I was consistently screwing up an area (be it my own dumb fault or some odd bit of game design), after putting down the controller, I couldn’t stop thinking about getting my hands back on the sticks to make Faith leap and slide across the game’s stark, maze-like environments. 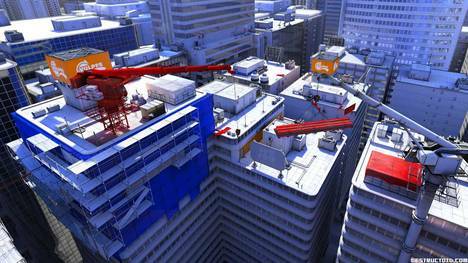 Despite frequent areas of aggravation, playing Mirror’s Edge is simply fun; keeping speed across a rooftop cluttered full of obstacles is both rewarding and exciting, and it makes it easy to forget the 25 minutes you just spent lost in a nondescript office building or plummeting to your death. How much time you’ll spend on the game’s story mode will depend on the player, and navigating through 10 chapters (plus one initial training mission) could take anywhere between six and eight hours. (My gameplay time was closer to six.) Of course, it’s possible that half of that time will be spent falling to your death or getting mowed down by automatic weapons at close range. And while the game’s story itself threatens to be interesting, it’s mostly forgettable, despite slick, Aeon Flux-style cut-scenes between chapters. But you’ll want to play through it until its somewhat easy and brief closing sequence, if only to unlock levels for the game’s Speed Run and Time Trial modes. These modes are, at the end of the day, what will keep you playing Mirror’s Edge long after you’ve completed the game’s all-too-brief final moments. “Speed Runs” focus on fastest times through chapters; tallying the “qualifying” times for each level totals 74 minutes, which makes my earlier claim of six to eight hours of gameplay seem a bit silly. The “Time Trial” levels are separate from those found in the story mode, only based on existing areas, with mandatory checkpoints spread throughout. It’s the “Time Trial” levels in particular that highlight the brilliance of Mirror’s Edge, ditching the punishing trial-and-error and frustrating combat sequences in favor of a “Faith vs. The Environment” mentality. The game features target time goals you’ll need to hit to gain stars and unlock other trials, but it’s the leaderboards that will have you repeating a single area over and over again, finding new and faster paths to reach the goal. For those with any bone of competitiveness in their bodies, this mode is what will keep you coming back for more. Unfortunately, the leaderboards in our non-retail review build lacked any way to isolate your friends’ best times; depending on your skill level, competing with the world’s best could become more depressing rather than fun. The experience is not flawless by any means, with a story mode that stumbles over too many frustrating sequences and not enough narrative payoff to make it worthwhile on its own. But taken as a whole -- with its frequent bits of brilliance and its delightful, heart-pounding moments -- Mirror’s Edge is a leap of faith worth taking.